TACB.org (The Association of Christian Businesses) is hosting The Champions of Business Super Conference with special guest speakers such as Frank Verdugo of The HOME Foundation, 5 time Heavyweight Champion of the World Evander Holyfield and many more. The HOME Foundation is proud to support TACB at this upcoming event. This free event will be held on November 1st and 2nd at the Palm Beach Convention Center. At last, a professional Christian business event focused on helping the Christian business professionals grow and market themselves! The Association of Christian Businesses (TACB) is the place where Christian business professionals seeking explosive growth and dramatic productivity come together to learn the latest marketing techniques and strategies to prosper their business. The Champions of Business Super Conference will be held on November 1st and 2nd in Palm Beach, Florida. The event features 5 time Heavyweight Champion of the World Evander Holyfield, Wayne Huizenga Jr., former CEO of Blockbuster Video and Waste Management, Mickey Markoff, Founder of the McDonalds Air and Sea, Frankie Verdugo of The HOME Foundation and many others. Learn from influential Christian leaders with extraordinary messages of inspiration and advanced marketing strategies. Christian business owners that will challenge and direct businesses to new heights, including celebrity athletes, CEOs, and some of the world's top marketing experts. Attendees will be able to network with other Christian business professionals in a power pack day fueled by like-minded creative entrepreneurs looking to discover tactics and strategies conducive to explosive business growth. “At last, a professional Christian business event focused on helping the Christian business professionals grow and market themselves! Real life examples and strategies that successful Christian business owners are using right now to grow and prosper their businesses” says Carl Foster, Veteran Radio and Television Host. 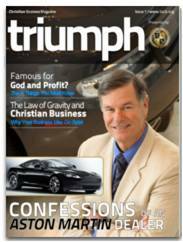 TACB also offers Triumph Christian Business Magazine, the only digital Christian Business magazine that one will ever need to stay on top of the latest marketing and business growth strategies for Christian business professionals. Triumph offers articles, videos, strategies and tips to grow one’s business and income and make a difference for God and others. The Helping Others Means Everything, or The H.O.M.E. Foundation, is a not-for-profit organization dedicated to helping our Family of Charities. Frankie Verdugo, President of The HOME Foundation, wants to help as many worthy charities as possible as they struggle during these tough economic times. Frankie Verdugo helps raise funds through luxury dream home raffles, home giveaways, prizes, and high profile celebrity events in Hollywood... "Our mission is to help charities reach their fundraising goals and to bring awareness to their praiseworthy causes."